The human energy field is thought to contain information that relates to all the activity going on within and around the person. 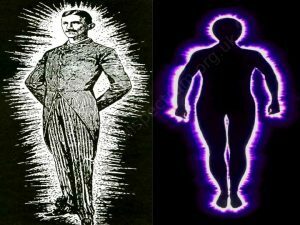 The human aura or light body is invisible because our eyes only respond to a band of wavelengths called the visible spectrum and as the aura lies outside of this most people are unable to see it with the naked eye. However throughout history many seers and sensitive’s have claimed to see this aura surrounding people. From their accounts it has been reported that disturbances or dis-ease within the individual shows itself as distortions or anomalies within the aura. The clairvoyants, C. W. Leadbetter and, more recently, Alex Grey produced magnificent works of art showing the intricacies of these auric fields. Slowly we are beginning to accept that spirit or vital energy is inherent in matter and that without spirit matter cannot exist. The idea that we live in a world of invisible forces, a cosmic soup held together within energy matrixes of varying densities vibrating at different speeds is slowly being substantiated by present day research and ever more sensitive technology. 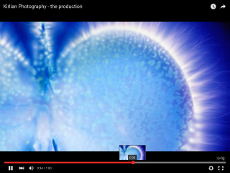 Radiation field photography is just one of the technological tools that can be used to view this invisible world. The part and the whole are intrinsically linked. Each part of the body contains information about the whole. Iridologists, reflexologists and acupuncturists use maps that they believe reflect the whole body and psyche within the feet, eyes and pulses. Kirlian electrographs are typically taken of the hands. Physiologically hands reflect aspects of the psychological state. Any strong emotional reaction can be seen to produce effects in the hands. They may become red, pale, clammy, dry, or tense in response to a sudden emotion. 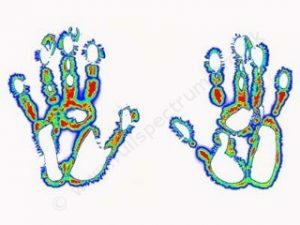 These and other psychological activities produce subtle changes in the radiation field around the hands that can be made visual by the electrographic process. Dr. Bell, a Scottish anatomist and expert on the nervous system, established that there are more nerves from the brain to the hands than anywhere else in the body. Cheiro, a famous cheirologist of the early twentieth century, reported that Dr. Bell’s studies revealed that Meissen’s corpuscles, minute tactile sensors, in the hands, vibrate in response to the fluctuations in thoughts and emotions. 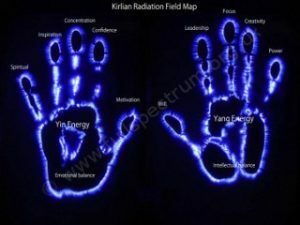 By colourising the Kirlian image it is possible to highlight areas of significance that are not so easily identified otherwise. The layering and light density hot spots can easily be seen giving the reader more information to work with. The printed colourised Kirlian image is both aesthetically pleasing and contains a wealth of information not usually available.